In the setting of the XXI Triennale International Exhibition, within the Rooms. Novel living concepts exhibit, Natuzzi will announce its collaboration with Salone del Mobile and Fabio Novembre, participating in his new project Intro. Curated by Beppe Finessi and supported by Salone del Mobile. Milano, Rooms. Novel living concepts will be hosted in the Triennale in Milan from April 2nd to September 12th, 2016. Natuzzi immediately accepted the invitation to be a partner in this dreamy, visionary installation. In the words of Pasquale Jr. Natuzzi, Communication and Creative Director of the brand: “Fabio’s project captured my attention immediately. His strong, decisive style had an intense impact on me. Intro represents a virtuosity which allows us to impart on visitors the know-how and craftsmanship that has always distinguished the company”. In fact, Natuzzi will produce the entire installation using above all the materials which are used to produce sofas like wood, to create the base of the installation and leather, the main character in this creation. Intro is a complex puzzle of different material, all assembled by hand: thermoformed acrylic panels covering a wooden nesting, giving life to an sloping spherical structure composed of 12 elements. 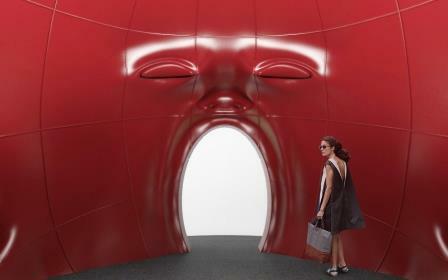 The interior, on the other hand, required all of the brand’s and its craftsmen’s know-how for covering in leather the inner walls in anthropomorphic shapes so to create an intimate and sensual alcove.